There continues to be mixed messages regarding house price data, with some surveys showing the trend up and others showing that prices are falling. Only recently a national newspaper claimed that Scottish house prices were rising at the fastest rate in 3 years. 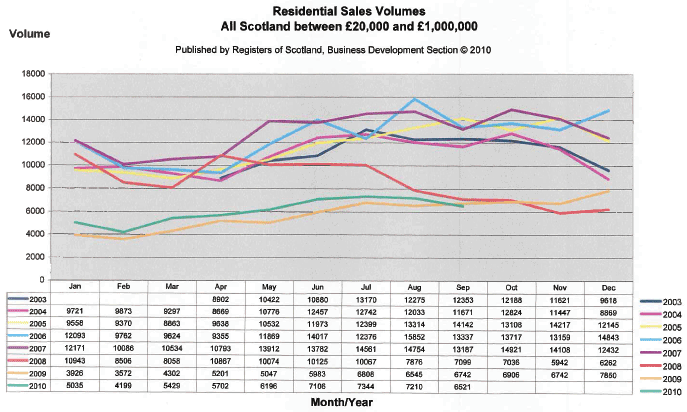 This graph from the Registers of Scotland shows the residential sales volume over a number of years. You will see that in September the 2010 line crossed the 2009 line for the first time. This is certainly a trend that I am noticing, with volumes starting to drop and fewer houses coming on the market. This will have an effect on average house prices and when you take into account the fact that the bottom end of the market, i.e. the properties that are normally bought by first time buyers, are not moving at all then this is also having another distorting effect on house prices. I feel that within certain parameters house prices will continue to plateau until the volume of mortgages increases, in particular for first time buyers. Given the shortage of properties on the market, I do think that it is a good time to be putting your house on the market as you are certainly going to make an impact. Previous Previous post: US housing turmoil – will the same happen in the UK?